Does Swedish military participate in illegal arms exports? Today Hans Andersson published an article in Swedish about suspected arms trafficking to Iraq during recent years. If that is true, it would probably not be the first time the Swedish government/military is involved in serious crime. Other cases include for example alledged complicity in outsourced torture and war of aggression in Libya. As usual with such cases, it seems impossible for anyone to be held accountable. In some cases, the Swedish police is even suspected of covering up the crimes. The author Anders Jallai has written about one such case, where the journalist Cats Falck and her friend Lena Gräns were found dead in 1985. When the women disappeared in 1984, Cats Falck was investigating arms trafficking from Sweden. Read more on the web site of jallai and the background material part 1, 2, 3 and 4 (links to content in Swedish). Jallai’s books are fiction, but it is widely believed that his writing actually contains much truth. This entry was posted in Uncategorized on 2017-08-31 by Webmaster. Are the taxes you pay wasted on an illegal war and even on protecting the opium/heroin business? Read the article by James O’Neill in English or Swedish. No wonder that there are many asylum-seekers from Afghanistan. This entry was posted in Uncategorized on 2017-08-24 by Webmaster. This entry was posted in Uncategorized on 2017-08-22 by Webmaster. In Turkey you can nowadays not access Wikipedia. In China you cannot access Facebook etc, unless you use VPN or another way around the blocks. In Russia, a new censorship law bans VPNs. But what is the situation like for the rest of us, living in the “free world”? Not everyone has realized how bad it is, but information can be suppressed here also. However, the methods are obviously different. Just ignoring information, which does not fit the official narrative, seems to be one popular method. For example, alternative media has recently reported about how the English translation Journalists for Hire of Udo Ulfkotte’s bestseller Gekaufte Journalisten appears to have been suppressed. James F. Tracy, who has worked as Associate Professor of Journalism and Media Studies at Florida Atlantic University, wrote in Global Research about how the book has been ignored by mainstream media and that the publisher Tayen Lane has removed any reference to the title from its website. Tracy suggests that the book would be “required reading for college students—and particularly those studying in journalism programs”. For those who are interested to read the book, it can still be ordered in German. Some other examples we have earlier reported about on this blog is how Swedish military museums have treated the history of a shot-down DC-3 and submarine incidents. Regarding the latter, we have not yet seen any reply from Ingvar Carlsson on an opinion piece in Swedish. 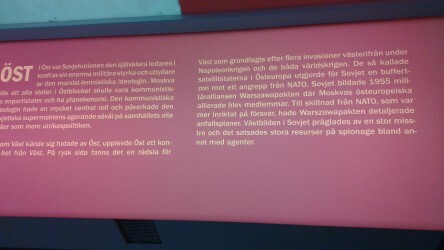 “Unlike NATO, which was more focused on defense, the Warsaw Pact had detailed attack plans“, claims a sign in the Swedish Naval Museum (Marinmuseum). There is so much credible Information available that does not fit the museum’s narrative, but it is obviously ignored by the museum. This entry was posted in Uncategorized on 2017-08-11 by Webmaster. Read the article about ISDS in The Intercept. This case should also warn people in other parts of the world about CETA, TTIP, JEFTA and other similar wolves in disguise. This entry was posted in Uncategorized on 2017-08-01 by Webmaster.